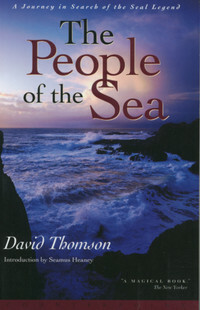 I'm not really sure why I picked up The People of the Sea by David Thomson from the library a few weeks ago. I just happened to be looking through the folklore section for The Once Upon a Time Challenge when it caught my eye. The People of the Sea are the thoughts and experiences of David Thomson as he travelled around the northern parts of the British Isles collecting stories about seals. David became obsessed with the folklore of seals when he was just a boy as he listened to gossip about a woman believed to have flippers. As a young man, he visited small coastal villages in Scotland and Ireland asking the locals for their memories and old tales. David doesn't need much to get the locals talking. All he has to do is mention he's looking for seals and people invite him to their house for tea and a chat. The stories they tell are heartbreaking or fantastical but each storyteller believes what he is saying. The stories are true no matter how unbelievable. I loved how they tried to put a date to the story when pressed: "That was a hundred years ago...no before that..."
David's book isn't so much about those stories, though they are an important part of it, but of the people and places he visits. Instead of just instruments for the tales, the people telling them are fascinating on their own. Like Mairi, a girl David meets twice, once as a child and then again as a restless young woman. Or Michael whose wife has died and left him with several small children to take care of by himself. He translates their personalities, even their voices, to the page. I want to know how Michael made out or if Mairi ever left her island. David also manages to show the divide between the old ways and the new. The old people criticize the younger ones' education or their modern ideas. For them, the old ways are the only ways. He does this all without inserting himself into the stories. He's just an observer. It took me ages to read this rather short book. It's not a rip-roaring story. David takes his time, writing his thoughts on the landscape or even the weather. I tried to figure out the timeline but it's nearly impossible. It could be months or years that have passed between his visits. Very little changes. You must have patience if you read this book. If you are interested in the origins of the selkie myths and the people who created them, you might enjoy The People of the Sea. Recommended. It sounds like the story might progress too slowly for me. I have this book because I was interested in Selkie myths after reading The Seduction Of Water by Carol Goodman but I haven't gotten to it yet. Now I know what to expect which is always good. Thanks for the review. Bookmagic- I hope you get to it sometime. Kathy- It's definitely something to be aware of.